The Knoxville Focus has been interviewing East Tennessee residents who are involved with their neighborhoods, organizations, or the county or city government. You may know them in their capacity as leaders but you probably don’t know their back stories, their families, or their interests. When The Focus asked Robert “Buzz” Buswell, director of Knox County Veteran and Senior Services, about someone that would be ideal to interview he suggested Chris Albrecht. 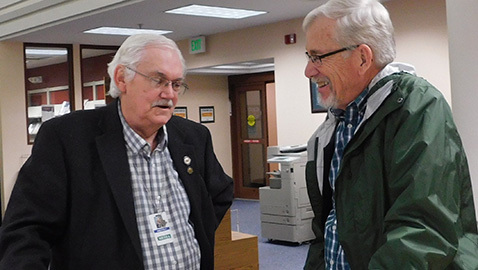 This week Focus reporter Mike Steely talked with Albrecht, public information director for the Capt. Bill Robinson Chapter of the Vietnam Veterans of America. The VVA’s Knoxville chapter is named for Captain Bill Robinson who was a prisoner of war for 2,703 days in North Vietnam. He was an enlisted man captured during a rescue attempt during the conflict. He is the longest held enlisted POW in U.S. Military history. Albrecht is a Navy veteran, a West Knoxville resident, and a husband and father. He’s retired and proud to speak on behalf of fellow Vietnam War era veterans. How is your position with the veteran’s organization going? I hadn’t given any thought about becoming involved, but when Don Smith, then president of the VVA chapter asked me to get involved as the public information officer, I thought “I can do that.” I kind of created the position to my own liking. Having worked in broadcast management, my strength is building relationships. People in local media know me now and will respond when we need something. Between writing press releases and making contacts it has been a lot of fun. I also sit on the board of directors for the organization. I’m pleased that our current president, Gary Ellis, asked me to continue as PIO. One of the things I enjoy in that position is going on-air for television and radio interviews. How has your position affected your family, business or other interests? My wife is supportive of everything that I take on, but the position has taken a toll on hobbies. I can’t sit still and I’m in the process of restoring a 1956 Feathercraft aluminum boat. I enjoy writing and photography and all kinds of things. Sometimes I get so busy with veteran work that those have to take a back seat, but I know they are sitting there waiting for me. But I enjoy what I do. My wife, Mary, retired from the University of Tennessee. She was the associate vice provost and is now working on a post-retirement contract with the graduate school. It’s been good for her as she phases her into retirement. Aside from the VVA I’m involved with the Optimist Club of Knoxville and have belonged to other Optimist Clubs for 36 years. I sit on the Optimist Club of Knoxville’s board of directors. We have a grown son, Will, who is 36. He lives in North Knoxville with his wife and our two grand dogs. I was born in Ohio and grew up in Grandview Heights, a suburb of Columbus. It was my wife’s work that brought us here nearly twenty-three years ago. Mary had the opportunity to become the department head for horticulture in UT’s Ag College. We had been at Kansas State University and we picked up stakes and moved. We had lived in Manhattan, Kansas for 16 years. They refer to themselves at “The Little Apple.” Being a university town, it had a cosmopolitan feel to it and it’s located next to Fort Riley, a major Army base. My first reaction on moving to Knoxville is I really liked it except for the traffic and I still feel that way. What do you see as your main accomplishment in life? Gosh, I’d say my proudest accomplishment is being the father of a fine young man. And having the same woman put up with me for almost 42 years. That is up to them, their perception, but I hope they seem me as an open and welcoming person. If you had to do one thing over in your life what would that be? Looking back, I don’t think I’d been so quick to get out of the service. Although when I got out the military was not a popular place to be. Few appreciated you. With hindsight being 20-20, I could have stayed in and jumped over and become an officer. I look at myself now and think I could have become a pretty good Naval officer but at the time I was still just a kid. If you could choose one thing in your position that is very satisfactory what would that be? The most satisfying thing is getting to know my brothers in-arms, people who served at the same time, went through some of the same things whether they were in combat or not. We were all serving our country. We can all look at each other as brothers now and enjoy that camaraderie. There’s a comfort level, guys can talk because they are going to be understood. I certainly couldn’t argue with that. One of the most rewarding things about becoming a member of the VVA has been getting to know and become friends with Bill Robinson, a remarkable human being. We were 16 hours in the car, just he and I, driving down to Florida. I heard many stories of his experiences in the “Hanoi Hilton” as it was known. How someone could go through what he did and be normal and well-adjusted is a wonder to me. What’s your favorite meal or place to eat? That’s easy, breakfast! Bacon, eggs, sausage, all those things that are supposedly not healthy. Sadly, I’ve given up donuts and all of the sweet stuff because my middle doesn’t need them. If I’m going to take in carbohydrates I’m going to reserve that for beer. I have no one favorite place to dine in Knoxville, I try to enjoy where ever I am. We eat out often and it’s not about my favorite place to eat but my favorite people to dine with. I’d like to be thought of as someone who cared. That’s why I’m involved with groups helping people. I’d like to be remembered as someone who made a difference.